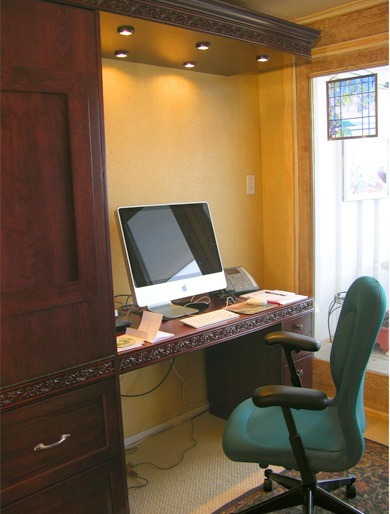 Murphy Bed Home Office is a versatile solution for primary residences as well as vacation homes. This seasonal home in Beaver Creek, Colorado presented three design challenges. It needed to function as a home office three months each year. It needed to quickly and easily change into a nice guest bedroom. And, most importantly, it needed to be hidden in plain sight in the main Great Room! 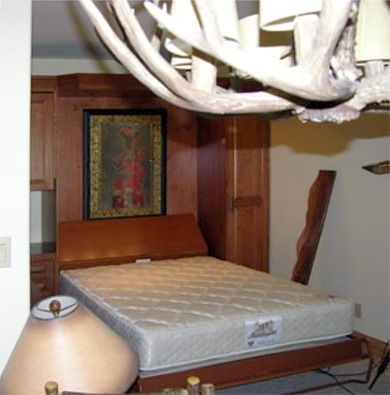 We were asked to come up with something unique and innovative for the bed face treatment on our SICO Queen EuroBed. Well, why not artwork? We started with plain sliced Cherry with sequentially matched grain, then added raised solid Cherry panels. Next we added some Colorado mountains. Lastly, we added five HERA® LED lights with dimmer control. We spent 3 nights at the factory designing a mountain scene behind the city lights of Denver. 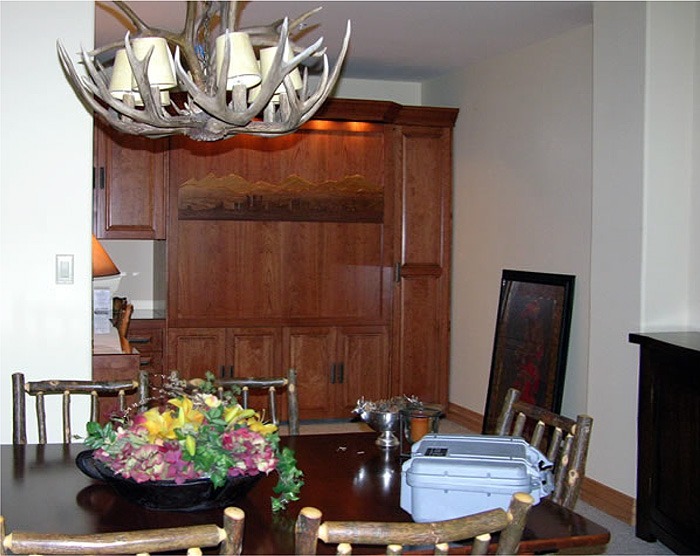 This design was copied onto solid Cherry blanks, with each mountain range being stained a different hue. 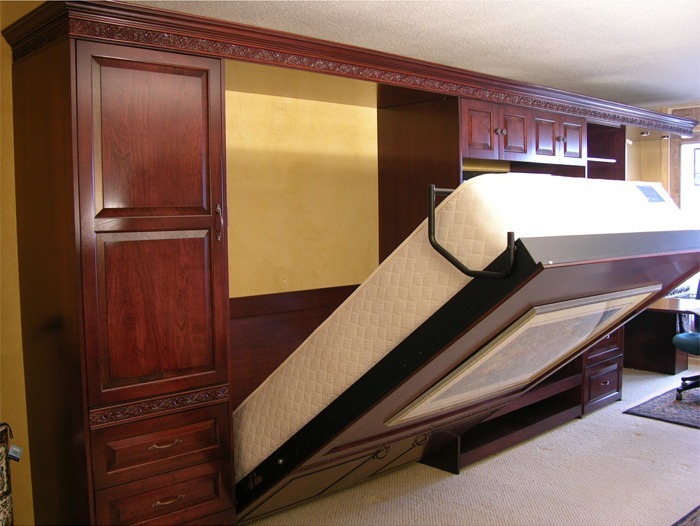 The final product was mounted onto the bed face of our SICO EuroBed. Requests have come in from Fargo, North Dakota and Galveston, Texas to have their skylines reproduced on our beds. Our artwork personalizes your investment. Now, THAT’s what we call a Vote of Confidence! 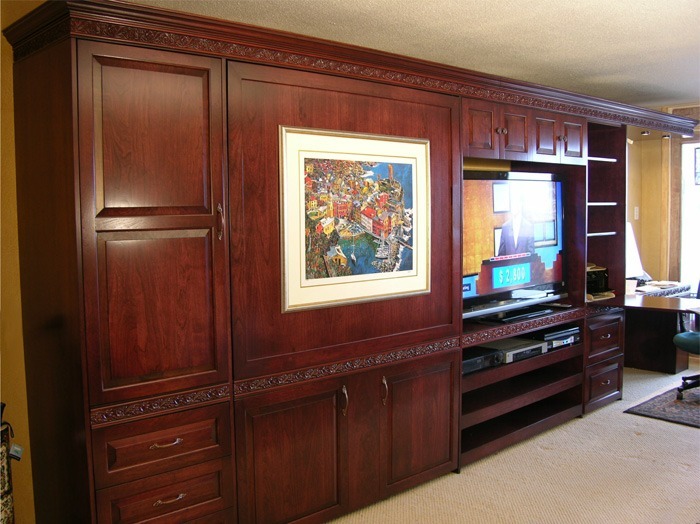 Murphy Bed Home Office designs can start with an inspiration piece. 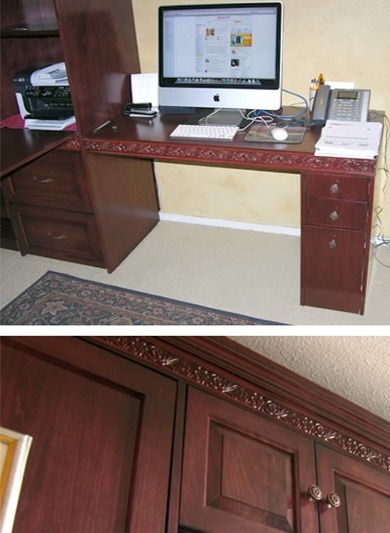 The plans for this system started with a relatively simple Cherry armoire. 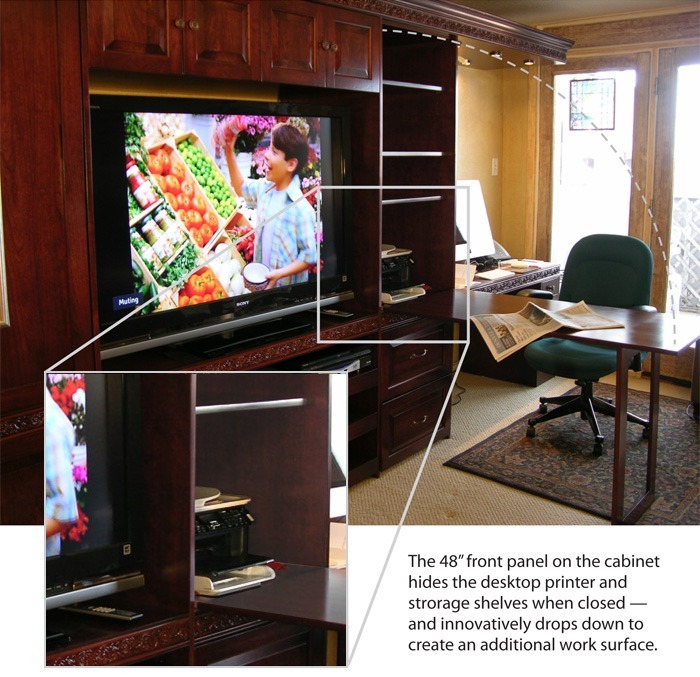 The justification for increasing the overall width was validated when Robert & Bobby determined this design would make their space more valuable as it transitioned from a living room into a dual-purpose room. You can insert your own artwork onto the leg of the drop-down table for that decorative touch when the table is folded away. 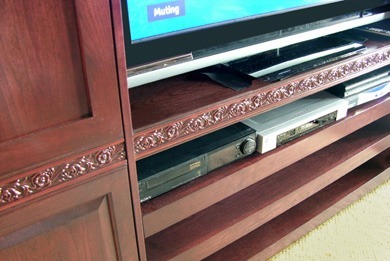 After installing this system, we mounted lights into the top panel, hidden behind the crown trim. This creates an illuminating accent, gently painting the ceiling and back wall with soft tones. Photographs simply don’t do justice to this lighting technique. 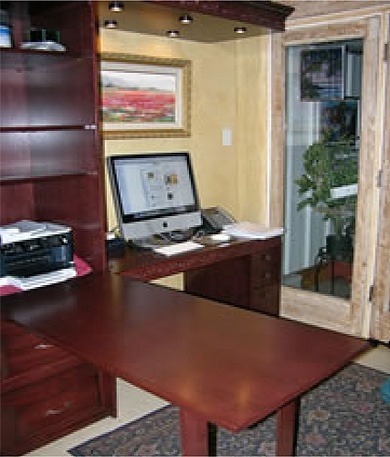 The desk with the Apple computer is 48 inches wide. There are five HERA® LED lights in the suspended crown, illuminating the work surface. Close-ups of the motif detail in the crown as well as at desk level. The front panel on the cabinet to the left drops down to create an additional work surface. 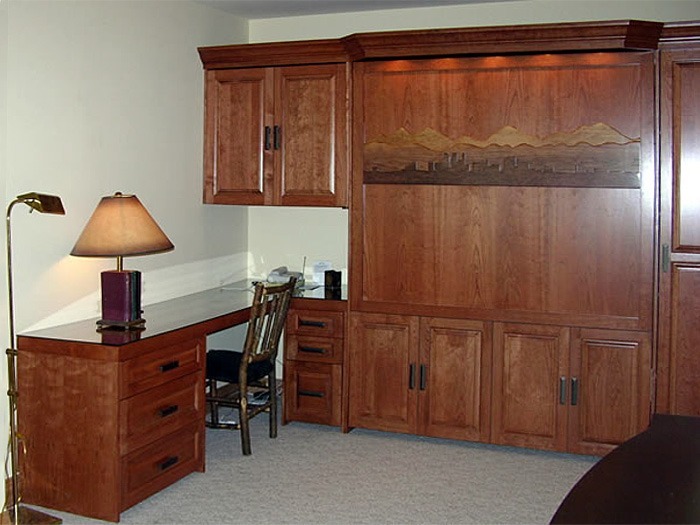 Or see more Murphy Bed Home Offices here.